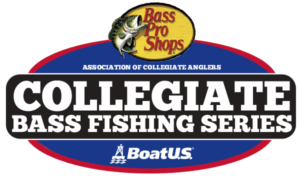 Teams competing on behalf of their collegiate fishing clubs in any major ACA major/championship events will earn points that accumulate in the Bass Pro Shops School of the Year presented by Abu Garcia race based upon the ACA Points System. ACA BoatUS Championship event will be worth 1,000 points regardless of field size. 1st place will receive a max of 1,000 points and will decrease by 20 point increments down to 20th place (620 points). 21st down to 60th place will decrease by 10 point increments. 61st place down to 100th place will decrease by 5 points. Only the top 100 places will receive points. You must weigh in fish in order to receive points. In those major/championship events, as identified by the ACA, up to two (2) teams per university/college fishing club may earn points in each of the recognized tournaments. In the event a college fishing club has more than two (2) teams in a tournament, points will only be awarded based on the two (2) highest finishing teams’ final standings. The ACA Major Events are critical in shaping the final outcome as these nationally televised events are worth “double” points, meaning that two (2) teams per college fishing club may earn points. Teams competing on behalf of their collegiate fishing clubs in any major FLW/BASS major events will earn points that accumulate in the Cabela’s School of the Year presented by Abu Garcia race based upon the ACA Points System. FLW and B.A.S.S Major Events will be worth 500 points regardless of field size. 1st place will receive 500 points and will decrease by 5 point increments all the way to the last team earning points for their places in the standings. You must weigh in fish in order to receive points. FLW and B.A.S.S Championship Events will be worth 700 points regardless of field size. 1st place will receive 700 points and will decrease by 20 point increments down to 20th place. 21st place all the way to the last team earning points for their places in the standings, points will decrease by 10 point increments. The last place earning points will be 50th place with 20 points. You must weigh in fish in order to receive points. Universities/colleges will be allowed to host up to 3 sanctioned events for the year. If the school-run ACA-sanctioned event is an Open/Invitational, the top finishing teams from each school will be awarded points at any Open/Invitational event. When competing in a trail, the university/college hosting the sanctioned event will determine which 3 events will count for points. Only the top finishing team from each school will earn points based on the breakdown below. 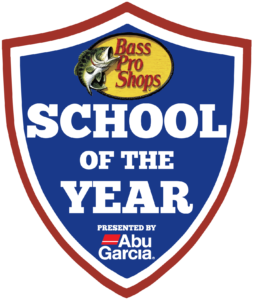 All School-Run events that are sanctioned for Bass Pro Shops School of the Year points will be eligible to receive a max of 100 points for 1st place regardless of the field size. Points will decrease in 5 point increments until last boat in the standings that weighed in fish will receive 5 points (20th place). All school run events must have at least 5 different schools competing to be sanctioned. The ACA encourages schools to create and run their own tournament or tournament trail; however, it is up to the ACA to decide whether or not to sanction the event(s) to go towards Bass Pro Shops School of the Year race. ACA will not sanction more than three (3) events from one (1) school per year. * All schools that host an ACA sanctioned event MUST have at least six members of their team signed up for TBF (The Bass Federation) Memberships. This helps to ensure proper insurance coverage and other benefits. This will also get those 6 members their FLW Memberships. * In order for a single open style event to be considered to earn points towards the Bass Pro Shops School of Year standings: it must be an event open to all university/college sanctioned clubs nationwide, have at least 5 schools compete, and not allow any non-college anglers to compete in it. No school will be allowed to host more than three events during any year. See below for point’s breakdown. If you have questions regarding the Bass Pro Shops School of the Year program, please contact the ACA at: college@carecotv.com. The ACA Director of Operations has any and all say in final point allocations towards the Bass Pro Shops School of Year Race.